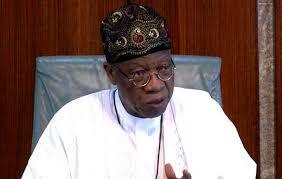 It’s not for political witch-hunt, Lai Mohammed defends Executive Order six – Royal Times of Nigeria. The Federal Government clarified today in London that the implementation of Executive Order six signed by President Muhammadu Buhari has nothing to do with 2019 general elections. The Minister of Information and Culture, Alhaji Lai Mohammed made the clarification at the Chatham House, a UK-based Royal Institute of International Affairs chaired by Dr Alex Vines (OMR). The News Agency of Nigeria reports that Mohammed, who made a presentation on the topic: “Nigeria’s National Unity: Towards Participation and Shared Values”, stressed that the Order was to strengthen the anti-corruption fight of the administration and not to witch-hunt any political opponents. He said that the Order was being misconstrued by naysayers and those who were beneficiaries of the past corruption-laden regimes. “The facts are very simple. Sometimes in July, the President, in the exercise of his constitutional powers signed the Executive Order six to strengthen the anti-corruption fight. “But last week, the court ruled in favour of the government and the government said that it is time to start its implementation,” he said.